Michigan poet Laura Kasischke’s latest volume, her eighth, won the National Book Critic’s Circle Award for Poetry last year. There is great risk in these poems. There is also an unusual kind of brilliance for the effort. They succeed in redefining what poems might look like—or even should look like—how they build upon on another, how they speak. 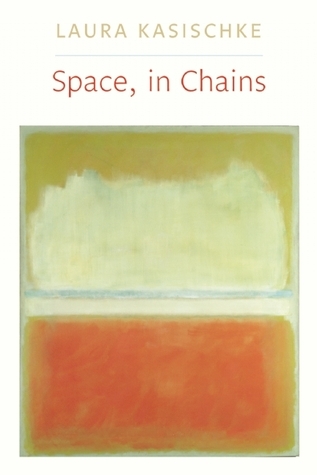 Readers who come to Space, in Chains expecting conventional lyricism or attention to form may need to work diligently, as has the poet, for the narrative. It is there, most certainly, and once we learn how to travel into and through the space of her poetry the reward is bountiful. The late Donald Justice, for one, said that all poems are about loss. No doubt there is room to argue for a more expansive definition, but that observation tells us something about grief, love, joy, and what befalls the body over time. Donald Hall is arguably one if our best known and skillful practitioners of this kind of work today. Ms. Kasischke positions herself nearby, a kindred sprit, perhaps, but she reinvents the delivery of that theme. She creates her own space. In the title poem we find what comprises our quotidian lives, constrained by invisible chains. Inevitably the subject is family: “Things that are beautiful, and die. Things that fall asleep in the afternoon, in/ the sun. Things that laugh, then cover their mouths, ashamed of their teeth. . . .” We look for the child. For his or her security, safety—the bosom wherein familial love resides. We find, now that we have signed on to the trope, that “It’s all space, in chains—the chaos of birdsong after a rainstorm. . . a small boy in boots opening the back door, stepping / out, and someone calling to him from the kitchen.” Stepping out. And what do we say, how do we universally speak to the boy, anxious about his well-being? “Sweetie, don’t be gone too long.” Perhaps just there, in that moment, is the first measure of loss. Let’s look at another poem, a work perhaps the spar or the keel of the volume, titled, “We watch my father try to put on his shirt.” It is a remarkable moment. “He cannot do it. The shirt / slips to the floor. There is / dancing and laughter in hell, an angel weeping openly on a park bench in heaven.” The imagery is as clear as it is wrought with the ineffable. The poet speaks fluently throughout her book in the voice of a child, of a wife and mother, and of the daughter desperate to keep her failing father alive just a bit longer, salvaging memory.